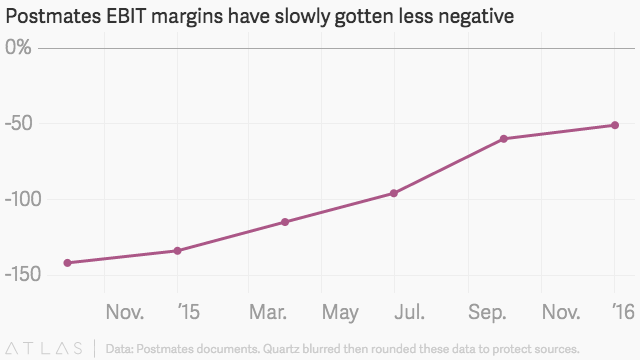 In a year that was unkind to many food delivery startups, Postmates made out relatively well. The company said in late October that it had secured $141 million in a funding round that Bastian Lehmann, its chief executive, described as “super, super difficult.” The fresh capital brought Postmates’ valuation to around $600 million, on par with the number from its previous funding in June 2015. Lehmann wasn’t discouraged. “Flat is the new up,” he told Fortune. To gain that funding, Postmates pitched a rosy vision of the future. The company forecast a dramatic turnaround over the next few years, trading tens of millions of dollars in losses for an equal amount in profit by 2018, according to a presentation from this summer reviewed by Quartz. At the same time, Postmates offered few details on how it planned to achieve these results. The documents provide a rare window into the fundraising process of one of Silicon Valley’s most hyped startups, and the ambitious numbers these companies often tout as they attempt to secure a deal. Postmates lost $47 million before interest and tax in 2015, on revenue of $52 million, according to the presentation. The company expected its loss before interest and tax to grow to nearly $60 million this year, even as revenue approached $200 million. It anticipated a much smaller loss in 2017, and earnings before interest and tax of nearly $90 million by 2018. To get there, Postmates told investors its annual sales—i.e., the total volume of food and other stuff that customers order through the platform—would increase nearly 400% over the next two years, translating into an even greater jump in revenue for the company. Postmates expected to clear about $1 billion in revenue on over $3 billion in annual sales by 2018, according to the documents. 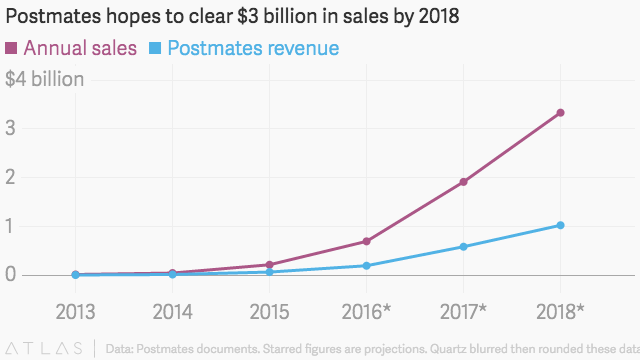 Postmates’ practical path to achieving this growth is less clear. The company said in the presentation it would make deliveries more efficient, and cut spending on customer service and courier recruitment. Lehmann told Bloomberg in late October that the company plans to expand internationally next year. Quartz reported earlier that month that Postmates was struggling to raise money, and had promised investors “substantial” deal sweeteners to coax its funding round closed. Postmates did not return multiple requests for comment for this article. Abundant funding is essential for on-demand startups like Postmates, which spend heavily on coupons and other discounts that make their services more attractive to customers. But money has been much harder to come by in 2016. Venture capitalists invested $1.7 billion in food delivery startups in the first three quarters of this year, compared to $3.6 billion over the same period in 2015, according to research firm CB Insights. 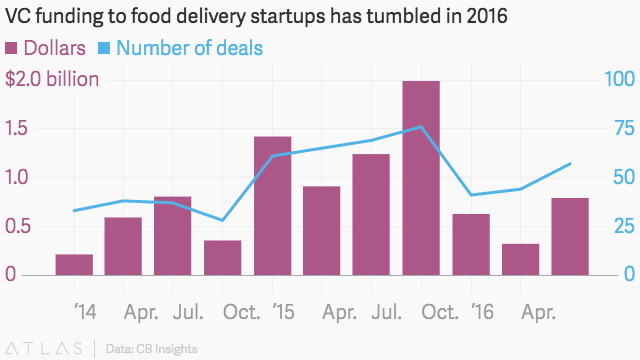 Worldwide, well over a dozen food, meal, and grocery delivery startups have gone out of business since the start of this year. Most of Postmates’ money is made off its “Anywhere” program, meaning deliveries from restaurants and other merchants with which the company has no formal relationship. On such orders, customers typically pay a delivery fee of around $8 or $9, plus a 9% service fee and optional tip, to have an item brought quickly to their door. Postmates books the bulk of its remaining revenue from “Plus” deliveries, which are made from merchants it has cut a deal with. For these, the company charges customers a delivery fee of $2.99 or $3.99 (plus a 9% service fee and optional tip) while also taking a cut from the merchant. Plus Unlimited, the $9.99-a-month subscription that Postmates launched this year, has worse margins than Anywhere or Plus, and made up less than 5% of deliveries as of this summer. Postmates has said its gross margins—typically defined as revenue minus the cost of goods sold—are holding strong, at above 20%. But other costs have kept its EBIT margins, a standard measure of profitability, in the red. For example, Postmates said in a footnote to its presentation that it was spending more than $120 to onboard each courier as of June. The company also retains only about a third of new customers after two months, and it’s unclear whether those that stick around end up becoming bigger spenders. While Postmates’ forecasts are still bullish, the company has tempered expectations from a year earlier. 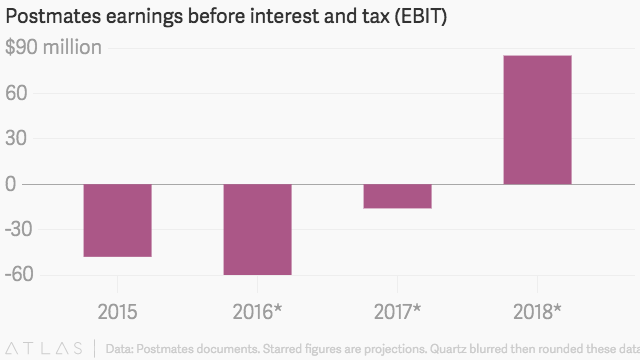 According to documents published by TechCrunch in April, Postmates originally forecast a loss of $26 million before interest and tax in 2015; a comparable loss of $4 million in 2016; and earnings of $61 million, before interest and tax, in 2017.